Verona has not only been my home town for 79 years, but has been my burning passion. 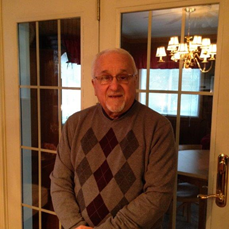 I attended St. Joseph Roman Catholic Grade School and graduated from Verona High School in 1953 -served as a class officer the last two years - played basketball for our section winning team in 1952-53. During and after high school I worked for local Pontiac and Buick dealerships. I got drafted into the Army and married my high school sweetheart Mollie Saxman in 1958. While stationed in Korea, I volunteered on off-duty days to teach English in a Korean night school. After my discharge, I worked at Oakmont Water Authority and Edgewater then attended the University of Pittsburgh, Penn State University and under the G.I. Bill, attended St. Francis Nursing School. During this time I was also an employee of the Veterans Administration in Pittsburgh (Leech Farm) until graduation in 1969. I was employed at the Department of Veterans Affairs Highland Drive Division as a Registered Nurse, then a Nurse Practitioner specializing in Psychiatric Nursing for 49-1/2 years. During those work years, I was involved in many Verona celebrations; i.e., Verona Centennial, Kennywood Picnics, conceived, planned and chaired the successful All Verona High School Reunion 1982 (over several hundred attendees) Verona Light Up Nights. One particular summer, with the borough’s approval, I acquired the paint and painted the cannon monument prior to the Memorial Day Parade. I played softball for St. Joseph 1963 State Champions. After softball Mollie and I attempted tennis, always had a passion for this sport – even winning a few trophies in the Pittsburgh City Parks Tournaments. Presently I am playing golf with Mollie and others - no trophies in this venue. Mollie and I have three children and three grandchildren. Recently I have taken several non-fiction writing courses from a local writer who is the North Carolina Poet Laureate teaching at Appalachian State University, Joseph Bathanti. He has encouraged me to write non-fiction stories from my past. So far, I have written 32 historical events of my life that correspond with Verona’s past history. One of my stories was printed in the Pittsburgh Post Gazette with another to be published during the upcoming spring baseball season. Maybe I enjoy writing because the stories transport me to the streets and people of Verona’s past.